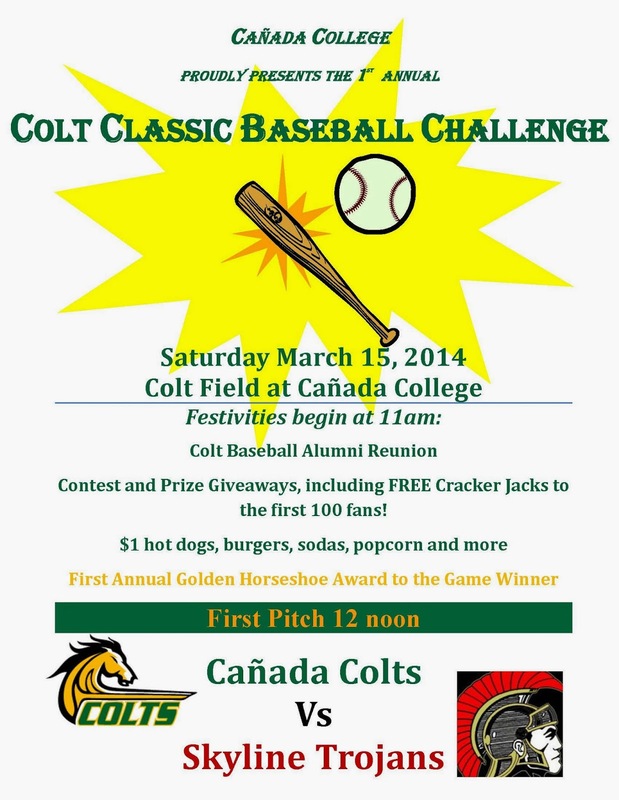 Cañada College is hosting an “Old Fashioned Day at the Ballpark” on Saturday, March 15. The Colts will be playing their San Mateo County rivals, the Skyline Trojans, for the Golden Horseshoe trophy in the first-ever Colt Classic Baseball Challenge. The event starts at 11 am with the first pitch scheduled for noon. The Golden Horseshoe is a new trophy that will be awarded to the winner of the annual home contest between Cañada and their two San Mateo County rivals – Skyline College and the College of San Mateo. The Colts alternate hosting CSM and Skyline each season. To enhance the ballpark atmosphere, fans can purchase $1 hot dogs, hamburgers, sodas, and popcorn. Additional food, souvenirs, and spirit items will also be available for purchase.